Four sets of candidates pitched their platforms to the student body on March 22. (Top L to R) Hannah Edelen and Matt Frey, Caleb Tiller and Taylor Gagne. (Below L to R) Derek Holden and Samantha Marcum, Jachelle Sologuren and Alex Voland. All four Student Government Association presidential candidates and their running mates worked to turn the upcoming student body vote in their favor. In front of a crowd of about 35, students gathered for the Thursday night debate on topics ranging from statewide and university budget challenges, making the campus better for under-represented minorities and handling issues of sexual misconduct. The event was moderated by The Northerner’s own Editor-in-Chief Mackenzie Manley and News Editor Sam Rosenstiel; the debate was also live-streamed on Facebook. The night began with a question that asked how each platform planned to make SGA more accessible to non-traditional and commuter students. Candidates Hannah Edelen and Matt Frey said they will continue to support communication between commuters (Frey is a one himself) and non-traditional students in relation to the rest of NKU. Taylor Gagne and Caleb Tiller also said they believe there need to be better initiatives in place to reach out to students through SGA in order to bridge the communication gap between the two groups. 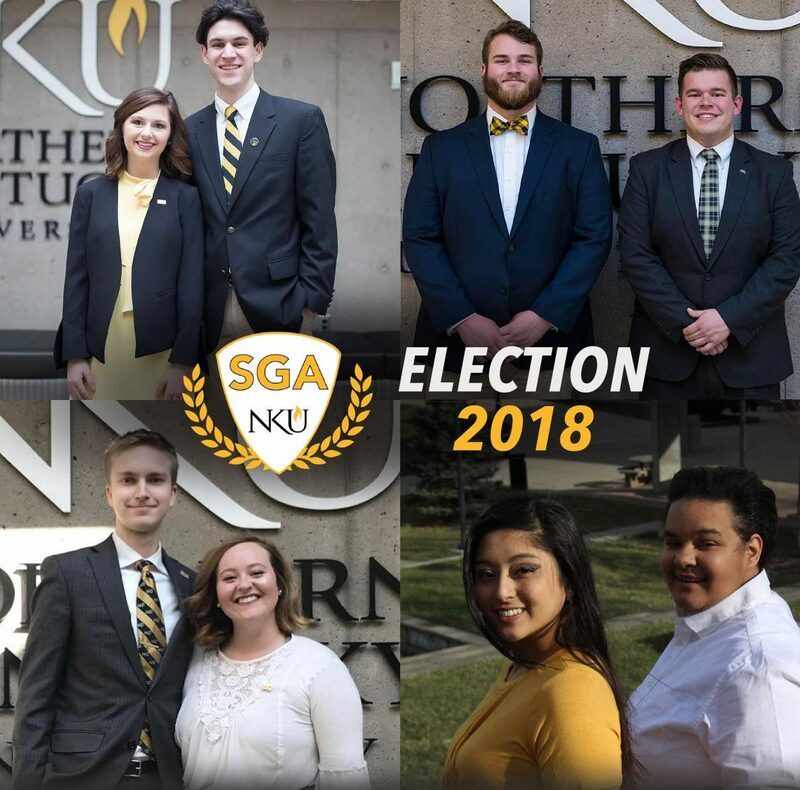 Jachelle Sologuren and running mate Alex Voland said it was important to make the NKU community “stay a community” by ensuring that the programs currently in place are there for future students. “I am the definition of a non-traditional student, I’m a commuter, old as heck, and a parent,” Voland said, noting that she feels her experience helps with their initiative to “get into the psyche of what we can do to serve [non-traditional students].”. As pension costs become a more and more prevalent issue, each candidate weighed in how they feel they would educate students on how budget challenges would directly impact them, and possibly their departments, as well as advocate against pension cuts. Holden was referencing to the Rally for Higher Education, which NKU students attend each year in Frankfort. He wants to push this information to students. Sologuren said that she will continue to directly ask students if they know how the budget cuts will affect them. Sologuren also mentioned that she is hosting a town hall about the issue of budget cuts on Monday, March 26 at 6 p.m. to help bring awareness to the issue of budget cuts to students, while also offering them a chance to ask questions. Edelen and Frey believe that the discussion first starts with advocacy. They have plans set for a ‘Norse Advocate Group,’ which would act as a liaison with SGA’s governmental affairs director. Edelen and Frey also pitched ideas to create Norse Rates, alongside Interim President Gerard St. Amand or discounts for Norse students, in places on and around campus in terms of childcare. When pressed about how the candidates would handle issues of sexual misconduct, Gagne and Tiller believe that the best initiative begins with changing the sexual harassment and assault policies to a policy that gives a defined line of consent. “One of our main pillars is to transform all of our sexual assault and harassment policies on campus to a ‘Yes Means Yes’ for affirmative consent mentality,” Gagne said. Tiller, a mentor in Norse Violence Prevention Center, adds that they want to educate the faculty on this policy and keeping them just as educated as NKU does the students. “We can not only educate our generation, but also the generations before us,” Tiller said. Edelen said that “As a sexual assault survivor, I know what it’s like to be silenced and I will never silence a student.” Edelen and Frey added that, if elected, they will adopt the Yes Means Yes policy. Sologuren and Voland say they will make more resources and work to create an environment that students feel safe to talk about situations and not only feel safe but are safe. Holden says that he and Marcum will work closely with NVPC to also teach students about the signs of sexual harassment and assault and how stop it from growing on NKU’s campus. When asked about how they would help underrepresented minorities on campus, both Sologuren and Voland had positive things to say about their experiences in the LAMP (Latino program and services); both support the NKU R.O.C.K.S program. Sologuren continued to say that her and Voland have experience as minorities themselves. Gagne said he would continue to fight for programs like LAMP and R.O.C.K.S, but that they also want to better include programs for the international students on campus. “We want to also increase funding for an organization called the ‘Globally Minded Student Organization.’ [The organization] partners international students with domestic students to help them get more acclimated to college and universities,” citing their ties to Greek life and other organizations as a way to promote this. Holden said their platform would be an advocate for maintaining those retention rates. They would reach out to minority communities in order to educated on what needs to be done. Later, per an audience question, each candidate expanded on their experience working with minority communities at NKU prior to the election campaign. Holden cited his job in student engagement as a his doorway to interacting with the various communities, where he would see what they needed. As president and member of Tau Kappa Epsilon fraternity, he also drew from experience there, where their involvement with minority groups expanded. Sologuren helped organize the first NKUnity event and continues to advocate for its continuation in the future. Currently, she serves as the public relations chair for Nu Upsilon Black Woman’s Honorary. Edelen also continues to advocate for NKUnity, citing her work and dedication to making sure the event happened again. She has worked with organizations like NKU R.O.C.K.S, Kappa Alpha Psi Fraternity, Inc., Alpha Phi Alpha Fraternity Inc. and the International Students Union. Gagne said that though he has not had much minority experience, he wants to learn. Tiller, coming from a predominately white town, said he came to NKU because of its diversity. He says he’s been a long advocate for the Black Lives Matter movement and educated himself on racial issues with Professor Joan Ferrante on the documentary Mourning the Creation of Racial Categories. Gagne and Tiller also realize that, as the only pairing without a minority or female perspective, as leaders they would work to fill their cabinets with students from several backgrounds and perspectives. Watch The Northerner’s livestream of the 2018 SGA presidential debate below. Student Government Association elections are March 28-29. Students can vote for student body president, vice president, justices, senators and other positions on OrgSync.